The Skirvin hotel was completed and opened in 1911 and named after its founder Willaim Balser Skirvin, who was a successful business man. The hotel was huge for the time it was completed, with a ten story two winged tower boasting 224 rooms. It also expanded at a substantial rate, with a new 12 story wing being added in 1925. 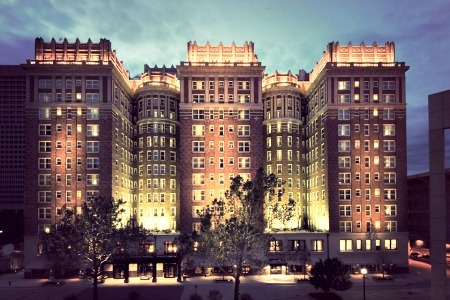 The last major expansion was completed in 1930 when all three wings in the hotel were rounded off at fourteen stories high, giving the hotel a total of 525 guest rooms. The hotel closed ion 1988 and sat abandoned until 2007 when it was bought by the Hilton hotel chain and is open today as a prominent hotel in the area. Is the Skirvin hotel haunted? The story about the haunting here looks like the product of a tragedy which has turned into an local legend. However what makes this haunting worthy of notice is the shear amount of people who have experienced the ghost here. There is thought to be two ghosts which haunt the hotel. The first is believed to be the ghost of a prostitute who was escorting a gentlemen into the hotel one evening. During their night together something caused an argument which got out of hand as the prostitute was killed by the man who hired her. People have claimed to have experienced the ghost of a rather forward women, with claims including seeing the apparition of a naked women appear when they are in the shower, and being touched provocatively by unseen hands. Whether a prostitute did die within the hotel and remains to haunt it is disputed, as such up-market establishments wish to protect their reputation, but the huge amount of claims of this nature cannot be ignored. The next ghost comes from a very sad story, which began with the hotel itself. The original owner, Mr Skirvin was a very wealthy, high class individual who enjoyed maintaining his social status. Now as you can imagine with a hotel of this size there will be a lot of staff to run it, and one of these staff in particular caught the eye of Mr Skirvin. He had an affair with the maid which resulted in her becoming pregnant. After Mr Skirvin discovered this he locked her on the highest floor, which was the 10th at the time. He simply didn't want to risk his image being ruined and hid the maid on that floor until after she had given birth. This resulted in her becoming very depressed and possible insane. She jumped from the window of the floor she was kept captive on with her newly born baby in her arms, both died in the fall. Since then people have reported hearing crying coming from the 10th floor from empty rooms and an uncomfortable presence in their rooms, as if someone with great misery were standing over them staring down. Both the Chicago bulls and the New York nicks have stayed in the hotel and both teams claimed to have experienced a number of spooky encounters.